Hello Crafting Friends, Leanne here and so excited to be with this fabulous design team. Thanks to Darlene last week for adding a card on for me. I did receive these wonderful dies and ready to share with you what I created. I cut out twice, once in green and once in red, and added pearls in the red centers, as well in each corner. 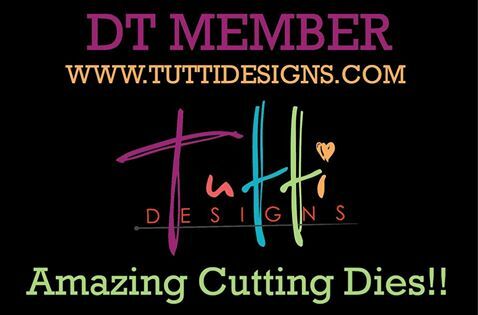 Please be sure to pop over to the Tutti Designs Store and check out all of the fabulous dies available. That's a gorgeous die....and the poinsettias just pop against the white!So pretty! Lovely card, Leanne! This corner die is a favorite of mine. I love all of the white space and the pop of color in the corner. Very pretty card Leanne, looks gorgeous in those colours. Beautiful creation with is fabulous corner die! Just perfect! Thanks for wonderful inspiration Leanne! !